Strawberry season has finally arrived! One of my favorite summer flavors. The season is always far too short and unfortunately this year it looks like the season will be shorter than usual. 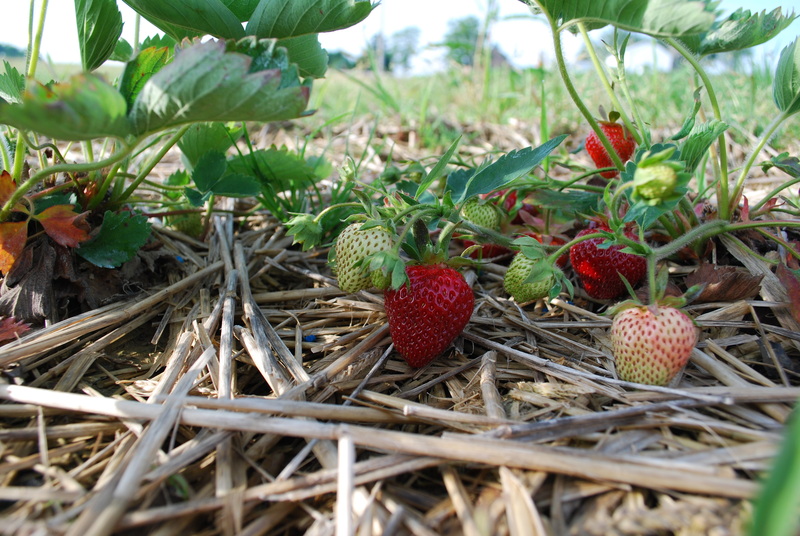 Strawberry season this year got a later start due to the rough weather we’ve had this year. Finally the berries came around, but we have lost a portion of our strawberry crop. The plants that were fortunate enough to make it through the harsh winter are bearing less fruit this year. Two days into our berry season and our staff has pretty much picked all of the ripe fruit from our fields. A new recipe I tried this season is a Strawberry Lemonade Cookie Bar. Tangy lemon is a perfect balance to the sweetness of the strawberries in this cookie bar. A classic combination served up in a simple, portable medium great for taking to parties or a simple dessert for a weeknight. A special thank you to Bakeaholic Mama for the recipe inspiration. And you can stop by her site for her lemon glaze to top them off … if you can resist them long enough! Preheat oven to 350 degrees. Line an 8×8 baking dish with foil and spray foil with nonstick cooking spray. Cream together butter and sugar. Once fluffy, add in lemon zest, lemon juice, and egg. Beat until smooth. Add flour mixture and mix until smooth. Fold in strawberries. Smooth batter into pan and bake 35-50 minutes or until lightly browned and until a toothpick comes out clean.